Our journey begins in 1999. The same year the European Union first introduced the Euro and Nelson Mandela’s presidency of South Africa came to an end. Meanwhile, our founders, Rob and Marion Harris, were busy helping their son Mark and several of his school friends find a way to spend their gap year helping out in a wildlife reserve in South Africa. Having been keen supporters of conservation work in South Africa for many years, they soon found one of their contacts who was happy to welcome a group of young wildlife enthusiasts in exchange for some financial support. 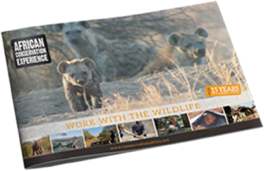 This gave Rob and Marion an idea: perhaps they could generate a constant stream of financial and practical assistance for conservation projects in southern Africa and facilitate an amazing experience for animal lovers. And so African Conservation Experience was born. Since that first pioneering trip, we have organised thousands more for conservation travellers of all ages from all over the world. We have formed close partnerships with a range of amazing wildlife projects and conservation professionals and are currently supporting work in South Africa, Zimbabwe, Botswana and Namibia. While our scope has grown considerably, our focus and ethos has not changed. We are still proudly wildlife conservation specialists. We continue to help sustain the natural world by supporting ethical and ecologically important initiatives. And we haven’t wavered from our mission to inspire, challenge and empower people to make a difference to wildlife conservation. So what does the future hold for our company and our travellers? While we’ve helped wildlife conservationists in southern Africa reach a number of important landmarks, there are always new challenges on the horizon. We are currently a leading player in the fight against cruel practices such as lion farming and cub cuddling. We are also working with all our projects to find new ways of supporting wildlife conservation while giving travellers an even more rewarding and authentic experience.